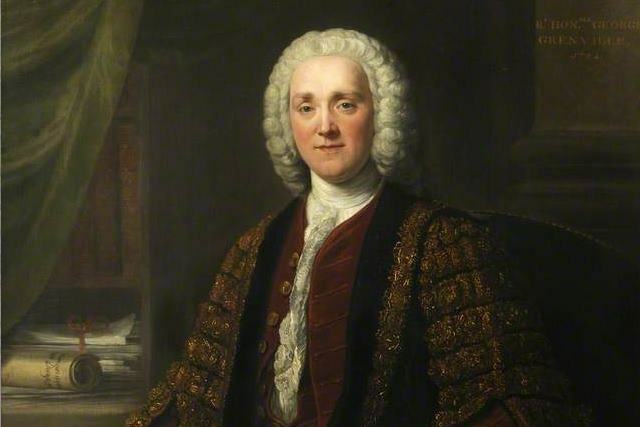 George Grenville came from a political family and ultimately emerged as an important political figure in his own right. He was born in October 1712 at Wotton, Buckinghamshire. His father, Richard, sat as an MP for Wendover and Buckingham but Grenville’s career was helped more by his mother’s brother, Richard Temple, Viscount Cobham of Stowe. Grenville was educated at Eton and Christ Church, Oxford. He did not graduate but entered the Inner Temple and qualified as a barrister in 1735. His elder brother, Richard, had entered Parliament through Cobham’s influence in 1734, joining the group of Walpole’s opponents known as ‘Cobham’s cubs’. William Pitt the Elder was another prominent member of this group which George Grenville also joined when he became MP for Buckingham in 1741, a seat he was to hold continuously until his death in 1770. Cobham’s followers remained staunch critics of the administration, even after Walpole’s fall in 1742. Following Carteret’s departure from the post of Secretary of State in 1744, they reached terms with the dominant Pelham faction and Grenville joined the Admiralty Board in late 1744. He spoke on naval matters in the Commons but hoped for further promotion. He joined the Treasury Board in 1747, further developing his financial and administrative skills. Grenville married Elizabeth Wyndham in May 1749. Elizabeth’s father was Sir William Wyndham, a leading Tory politician of the Walpole era. Her grandfather, the Duke of Somerset, disapproved of the marriage and settled very little property on her. Elizabeth’s brother, Charles, second Earl of Egremont, was a firmer supporter and ally. The couple had four sons and five daughters. Their youngest son, William Wyndham Grenville , eventually became Prime Minister himself in 1806. After Pelham’s death in 1754, Grenville was promoted to Treasurer of the Navy and joined the Privy Council. Grenville was aligned to the political faction led by William Pitt the elder in the Commons and Richard Grenville, now Earl Temple, in the Lords. Pitt was Paymaster of the Forces but had a difficult relationship with Newcastle, Pelham’s successor. Grenville followed his lead, acting as Pitt’s deputy in the Commons. The bonds between them were strengthened when Pitt married Grenville and Temple’s sister, Hester, in November 1754. Grenville was dismissed in November 1755 but hoped for promotion when Pitt subsequently negotiated to form an administration with first the Duke of Devonshire in 1756 and then the Duke of Newcastle in 1757. His hopes of becoming Chancellor of the Exchequer were thwarted and he returned to being Treasurer of the Navy. Grenville had grown close to the future king, George III, during the 1750s and George’s accession, combined with his frustrations with Pitt and Temple, led to a change of heart in 1761. Pitt and Temple resigned in October over disagreements about the conduct of the Seven Years War , but Grenville did not follow them. While he refused to take Pitt’s position as Secretary of State for the Southern Department, he proposed his other brother-in-law, Egremont, for the position and instead became leader of the House of Commons. He remained in government following Newcastle’s resignation, becoming Northern Secretary in Bute’s administration, but his tenure was unhappy. He disagreed with Bute and the King about how to achieve peace and found himself side-lined and, eventually, moved to the Admiralty. However, Bute’s resignation created a new opportunity. The King, reluctant to bring either Newcastle or Pitt back into power, offered Grenville the positions of First Lord and Chancellor of the Exchequer. Grenville’s ministry was marked by two major parliamentary controversies. The first was over the legality of general warrants, an issue provoked by attempts to censor the political radical John Wilkes and his populist attacks on Bute. Grenville insisted that the courts, rather than Parliament, should decide on this. The second was over taxing the American colonies. The costs of the Seven Years War (1756-63) meant that Westminster was keen for the American colonists to shoulder more of the burden of imperial defence. Grenville wanted customs duties to be enforced strictly and proposed a new set of stamp duties to raise revenue. The colonists protested vociferously, and ultimately this sowed the seeds of the American Revolution. In Parliament, MPs backed the right of Westminster to raise taxes but some were less convinced of the practicalities. George III had already lost patience with Grenville. Irritated by Grenville’s assertive attitude towards him and his desire to control all official appointments, George turned to the Marquess of Rockingham instead. Grenville continued to sit in the Commons until his death in November 1770 but he had made too many enemies, the King in particular, to return to office even in the ministerial merry-go-round of the 1760s. The Navy Act 1758: to speed up the payment of seamen’s wages and enable them to send a portion home to their families. The Stamp Act 1765: required all legal documents, licenses, commercial contracts, newspapers, pamphlets, and playing cards to carry a tax stamp. The Parliamentary Elections Act 1770 - aka The Grenville Act: transferred the power of trying election petitions from the House of Commons to a small committee of MPs selected by lot. "When he has wearied me for 2 hours, he looks at his watch, to see if he may not tire me for an hour more."